In east London a small group of religious hardliners is intent on dividing society and creating conflict. We look inside the Britain First patrols that are directly provoking the Muslim community. Britain First is the most active far-right group to emerge from the collapse of the BNP and EDL over the last year. Their leader on the streets, Paul Golding, is a former BNP councillor and their political guru, Jim Dowson, was previously in charge of BNP finances. Together the pair are building a provocative political far-right organisation with a small, pseudo-paramilitary “defence force” taking their message to the streets. Last month Channel 4 News followed the group as it travelled across London, visiting the private homes of Muslim hate preachers and nearly provoking a riot on Brick Lane, where it marched handing out anti-Islam leaflets. 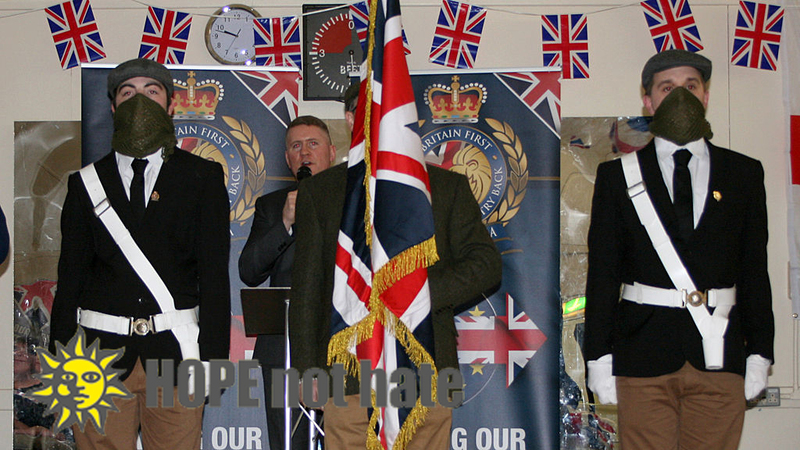 Pictures seen by Channel 4 News also show the group’s chairman, Paul Golding, speaking at a private Britain First event with a masked paramilitary-style colour party flanking the stage (see image below). Video footage released by the group also shows “Britain First defence force” members training for unarmed combat at a London gym. Driving military LandRovers, wearing uniforms, recruiting former soldiers and training for combat, this is a far-right party with dangerous intentions – but far fewer supporters than its EDL and BNP predecessors. What it does have is a huge social media presence: the Britain First Facebook page is approaching half a million likes. Britain First’s social media posts mix far-right politics, populist nationalism and, more bizarrely, pictures of Gandhi, Princess Diana, and even animal rights messages. The group has millions of people sharing, liking and commenting on its posts every week, a level never reached by the EDL. Many do not realise they are interacting with the extreme right. Their social media posts mix far-right politics, populist nationalism and, more bizarrely, pictures of Gandhi, Princess Diana, and even animal rights messages. Anything to get more likes and share and build the group’s presence. Files released by the Hope Not Hate campaigning group suggest that as many as 2 million people could be interacting with Britain First content online each day. Behind this success is Jim Dowson, whose company Midas Consultancy previously helped to boost the popularity of the BNP. He told Channel 4 News he learned how to create publicity campaigns like this from pro-life groups in the US. Dowson has a long history of anti-abortion campaigning, and previously ran the BNP’s call centre, earning him the title of “the person who owned the BNP”. Mr Dowson claimed to Channel 4 News he raised £4m for the BNP coffers in a bid to drag British politics “further to the right”. This time around he wants to bring political lessons learned from violent loyalist protests in Ulster to the streets of Britain. After breaking with the BNP in 2011, Dowson became heavily involved with Ulster loyalists, leading flag protests in Northern Ireland and launching the Protestant Coalition last year. In 2011 Dowson took Paul Golding, a former BNP councillor and director of publicity, under his wing, and together the pair have been building Britain First as a hardline Christian opposition to Islam in the UK. As with other projects backed by Jim Dowson, Britain First makes regular appeals for donations, offers merchandise for sale on its website, and runs a hotline for membership and donations. However, the group has also adopted a loyalist-style structure, with a political wing backed up by a more military-structured “action force” whose members assumed titles like “provost marhsall”. A Britain First document produced by Dowson urges recruits to seek out the working-class estates and “if it’s a high crime area, get the unit to put on visible patrols… after a few months start to encourage people to help put up flags, England or Union Jacks on the lamp-posts… if possible paint the kerb-stones at the entrances, red/white and blue. Dowson even boasts; “I have lived in the worst trouble spots of Belfast; I have had high powered machine gun fire rip bricks from my house and have been injured by grenade attack. Britain First’s main activity in recent months has been invading mosques across England – with Paul Golding and other members posting videos online of the group provocatively entering mosques in Luton, east London and Bradford. On the streets of east London Paul Golding told Channel 4 News that if Islamic extremists did not exist, then his vigilante-style group would not be on the streets. This is disputed by Matt Collins, a former member of the National Front, a group Paul Golding also spent time as a member of. Mr Collins now monitors the far-right with anti-fascist group Hope Not Hate. He told Channel 4 News he sees Britain First as the single biggest far-right threat remaining in Britain. “Jim Dowson has raised money for extreme right-wing, anti-abortion or anti-gay groups, has protested outside abortion clinics, and made a living from heaping misery on people in desperate circumstances. “Paul Golding leads the organisation. He has a complete history of political failure – then he found God when he was living in Northern Ireland and has come back to England to build this militia with former soldiers.